Irrefutably, Bitcoin and most altcoins are bottoming up. However, it’s all about fundamental events and supply-demand dynamics that could affect price movement of most these altcoins especially EOS which had its EOSDAC air drop on April 15. 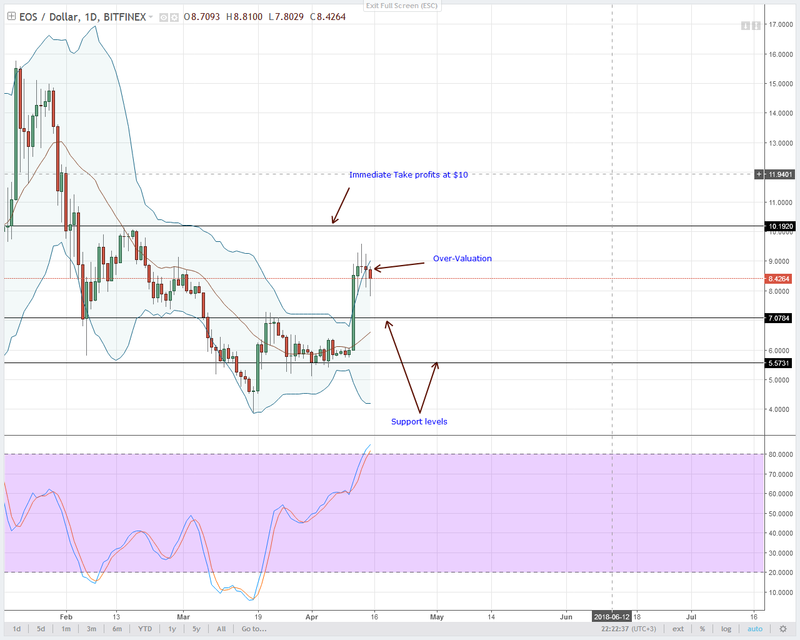 In my view and basing my forecast on EOS technical analysis, prices might retrace back to $6. In the last 24 hours alone, Stellar Lumens is up 16.28 percent. 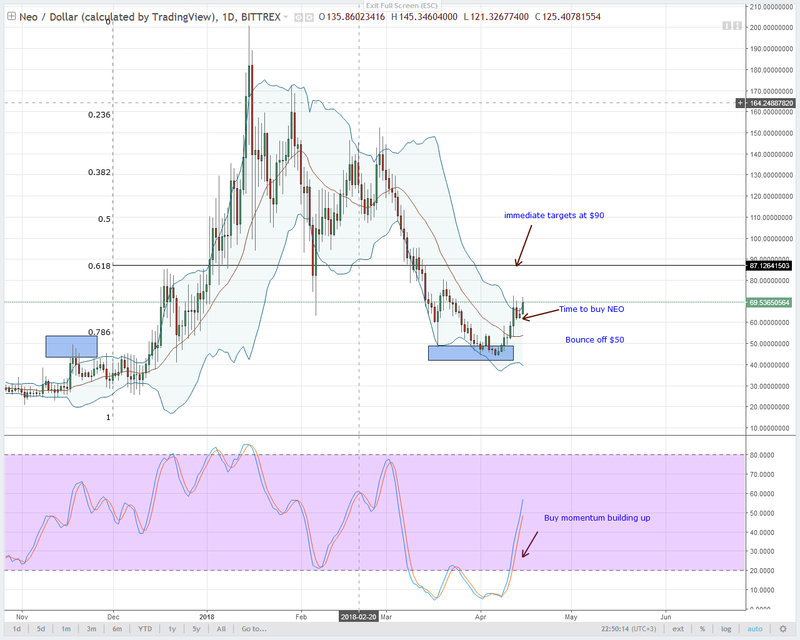 Even though there is little to talk on the fundamental front, it’s obvious that Stellar Lumens is ending the week at a stronger footing. Week over week, it’s up 44.68 percent and is the 3rd most performing coin in the top 10 after IOTA. When it comes to the charts, the daily chart gives us a better glimpse of price action. As we can see, bull momentum is up. Most notably though is the banding that is in its earlier stages. Check out those bullish candlesticks moving along the upper BB. It means buy momentum is strong and all we have to do is to look for buy entries in lower chart. 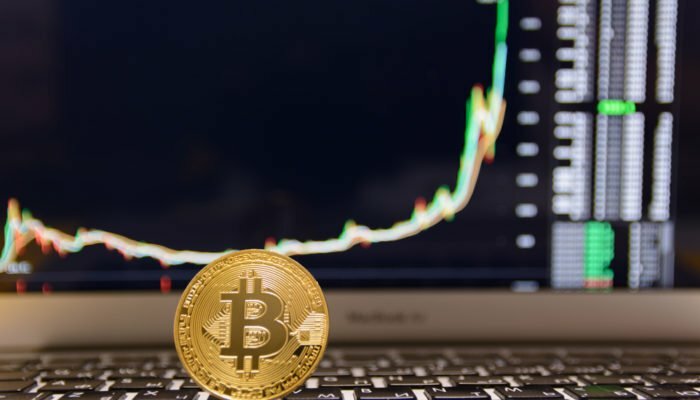 In my view, buying on dips at around $0.27 can be profitable and in that case, feasible bull targets should be $0.4 and $0.5 on the upper end. 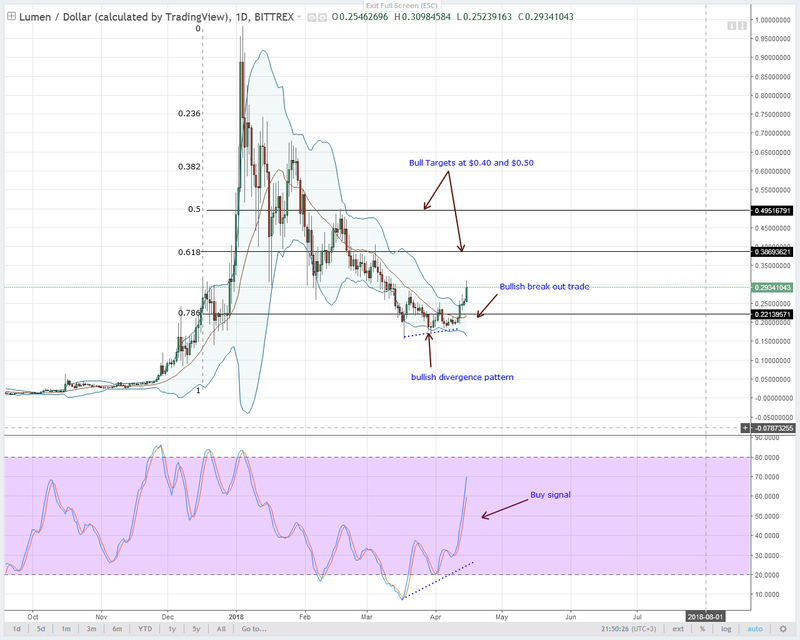 Of all the high performing coins bottoming out last week, IOTA is a stand out. Not only is it up 66 percent in the last 7 days, it has more potential for further upsides. I shall be watching this coin closely and with the addition of Jan Pauseback, will there be a positive response? Despite the FUDs going up and hard statistics hinting of a possible short squeeze-IOTA shorts is up 86%-there are chances that prices might after all explode to the upside. Historically, technical developments like these padded with higher highs and fear points to the end of a bear market. This is why I recommend longs and waiting for dips on lower time frames can be a perfect strategy. Our short term support lies at $1.45. 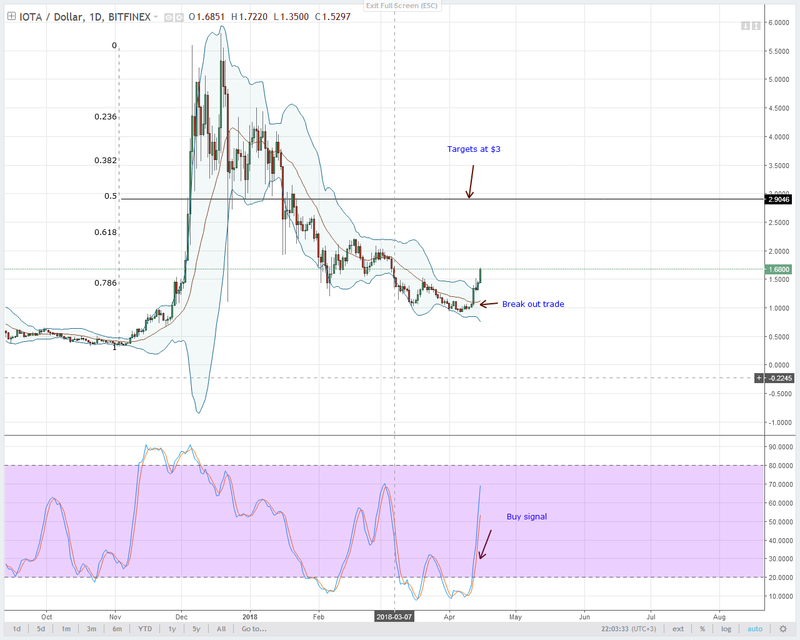 Should prices drop, then wait until a stochastic buy signal prints, buy IOTA and aim for $3. If you had over 100 EOS tokens on April 15, 2017 then expect to have your EOSDAC tokens in your Ethereum or Exchange’s wallet later. In case you had less than 100 EOS tokens, you can as well apply manually. Remember, the end game here is to develop and achieve this full decentralization according to EOS objectives. Anyways, besides this, Brendan Blumer the CEO of Block One said there are thousands of companies building apps on the platform. Nothing much is publically available about these companies but soon after EOSIO version 1 goes live in June, we shall know who these companies are. In the charts and EOS is up 43.24 percent in the last 7 days. However, not this though, prices are generally up but there is an over-valuation as the chart shows. Check out April 12-14 candlesticks which are above the upper BB and yesterday’s bear candlestick seeking for equilibrium. You can decide to stay out of this trade and wait for prices to correct say back to $6.5-$7 before looking for buy opportunities in the 4HR chart. If it interests you to become a Litecoin LN full node, then there is good news. There is a full length guide on how to install and the tutorial is literally available for everyone on the net. Other than this obvious good news, if you are in Germany you can now exchange fiat for Litecoin and other main coins at Börse Stuttgart through their app, Bison. 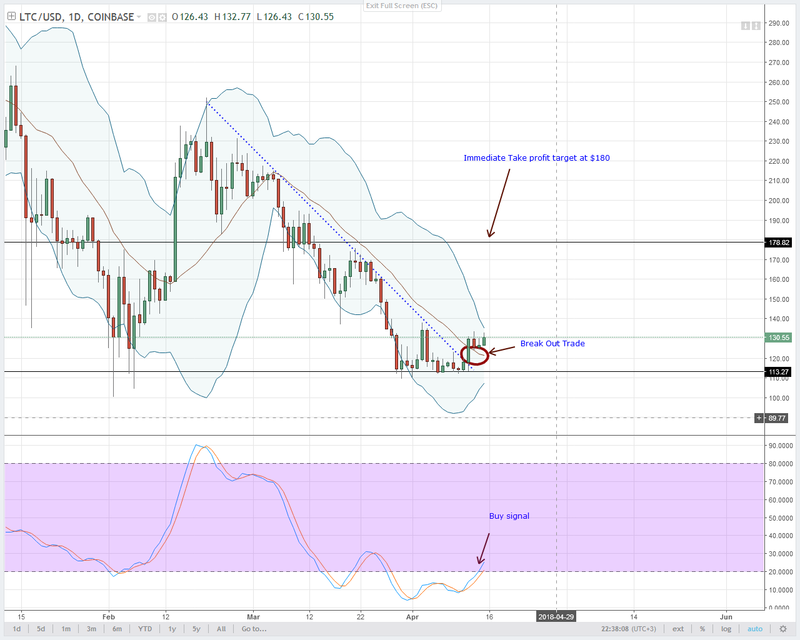 From our Litecoin Technical analysis, it seems like prices are in consolidation mode. Even though Litecoin is generally up adding 11 percent in the last 7 days, it’s finding resistance at $130 despite the strong bull momentum. Because of this, I recommend traders to pause their long entries until after prices trade above $135. Alternatively, buying on dips at around $115 and $120 can be a bargain. Overly, the ultimate bullish target of $180 is our main long objective. This year alone, we expect 3 DEX at NEO-Switcheo, NEX and Aphelion. Already we have a NEO web wallet for Aphelion and Switcheo is up and running. While NEO continues to gain ground, it’s the number of projects that are in the pipeline that may affect price in the coming days. Moonlight is one of the startups seeking for funds by issuing out their NEP-5 tokens. They are working towards their success and recently they announced partnerships with VDT and nOS platform. Even though we are net bullish on NEO-it’s up 45 percent for the week, I expect prices to pull back now that we can see sell pressure from April 15 candlestick. Potential buys zone lies at around $60 and bull targets at $90 as per our previous NEO technical analysis.